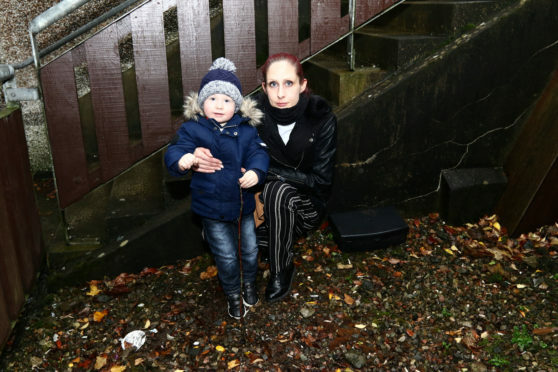 A mother of a two-year-old child has spoken of her shock to find rat traps dotted around the outside of her flat – with no warning from the landlord. Alison McKnight, 35, and her partner Damian Laird, 47, are tenants of a cramped one-bedroom flat at Burnside Court in Oban’s Miller Road. They have been waiting for a move to larger accommodation since their son David, two, was born. But the only place offered to them so far by landlord West Highland Housing Association (WHHA) was a two-bedroom flat in the neighbouring building with a history of a leaky roof. Miss McKnight first learned about the rats around three weeks ago when her upstairs neighbour showed her photographs of droppings. Then a black rat trap was placed in the close outside her flat, another outside the building and two in the indoor drying area. She said: “We didn’t get any letters to let us know when they were being put down, no warning. It’s a total lack of communication. She added: “One day I was hoovering when my wee boy said, ‘look mummy,’ I looked up and saw something black dangling above the living room window outside. Then five minutes later I heard scratching coming from inside the wall. Miss McKnight believes the rats must be coming from the Black Lynn burn, which runs behind the houses. She said that the one-bedroom is not big enough for a family, and that David had suffered “needless injuries” when learning to walk because the place was cluttered, with the cot taking up space in the living room. WHHA said they would now “take the opportunity to investigate the facts and will provide a response in due course”.